John has been doing very well in sales. But he knew he could do better. So he called me and asked for some help. He was making a very good living, but felt that he wasn’t focused. He wasn’t spending his time, effort and energy in the right places. John was running on two cylinders- which weren’t running very smoothly – and was still making £100,000. Set your priorities, get focused and managing your time – so nothing slips through the cracks. One day, when we were meeting, I asked John what his closing ratios were. He pondered that question for a few moments, and then said that he didn’t have the slightest idea. He had never kept any kind of statistical records. What is the size of your average sale? What was your biggest sale last year? How much money did you earn on it? What was your smallest sale last year? What is your profile for your ‘ideal’ client? 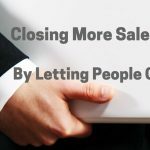 How many sales do you close on the first interview? The second? The third? The fourth, fifth, sixth, or tenth? What is your best source for leads? What are your sales, profit and income goals for the balance of year? What are your sales, profit and income goals for this coming year? John thought about these questions for a few moments, and with a puzzled-look on his face he said in a soft, quiet voice, “I don’t know the answers to most of your questions, but if you’ll wait a moment I can dig up the answers to the others, I just don’t have that information at my fingertips. Who your best – most profitable – customers are. How much they spent with you. What your most profitable products are. The average size of your sale. Because John didn’t keep any records, he didn’t know where he was, and as a result he didn’t know what changes he should be making in his business planning. Over the next few weeks John started keeping sales records. He recorded the names of the people he met with, what he thought they would purchase, the dates he met with them, whether or not they bought from him, and the amount of the sale. As we studied his records, I noticed something very interesting in his spreadsheet: He was closing about 23 percent of his sales on the first interview, 12 percent on the second interview, and 6 percent on the third interview. When he met with a prospect a fourth, fifth, or subsequent interview, only 2 percent of those people ever purchased. And those that did were his smallest – least profitable – sales. John had been trained in the “everybody’s a prospect” school of selling and had always followed the “I’m going to call on them till they buy or they die!” sales methodology. He had the persistence of a bull dog. He refused to let go. But as John was reviewing his records he observed that he was closing 37 percent of his opportunities in either the first or second call, and only 8 percent of his opportunities thereafter. As we pondered this interesting fact, we talked about how much time he was investing following-up on his opportunities. For the most part, the people who bought on the first or second meeting were rather easy sales. The people were fun to work with, and many of these customers became friends. But the 63 percent who didn’t buy on the first or second call were much harder to work with. They didn’t return phone calls or respond to voice mail or e-mail messages. They cancelled or postponed meetings. They weren’t easy to work with. As he spoke a light bulb must have turned on deep inside his head. A big smile came across his face as he realized what had been keeping him from making a lot of money. He was wasting the majority of his time chasing people who weren’t going to buy from him. We discussed a ‘novel’ idea: Stop calling on a prospect after the second call. If they haven’t bought, move on and look for a better prospect. A prospect who is in the market to buy from you TODAY. We spent the next few sessions working on John’s telephone techniques and helped him perfect his Elevator Speech. If you want to improve your telephone results, you need to have a GREAT Elevator Speech. And we spent time improving his networking skills so when he went to business and industry meetings he could meet more people, make more friends, find more opportunities, and close more sales. If you don’t have enough prospects, you probably need to improve your networking skills. Over the past few weeks, John’s results have been startling. Because he’s more focused on finding people who are in the market today, he’s not pushing himself on those that aren’t interested. He’s using the telephone much more effectively to find prospects and qualify them. His closing ratios have improved. He is making more money. And best of all, he’s got more time for his friends, family and himself. He’s no longer working harder, he’s not just working smarter. He’s working less.